Hopefully you are enjoying the lessons. Please let me know if you have any questions that you think I can answer! Last week we learnt numbers from 1 to 20 in Tulu. Today we are going to learn more numbers, ordinal numbers and how to tell the time. These are the cardinal numbers in Tulu. We use cardinal numbers for counting or to tell ‘how many’ of something or to tell the quantity. English: He works 10 hour a day. English: He works 5 days a week. English: I will wait for 2 hours. Whenever we want to add numbers to a neuter noun, we can avoid adding plural suffix and put the number before the noun. enk raDD kai uNDu – I have two hands. We never say ‘enk raDD kaikulu ulla’ in Tulu. English: There are two books on the table. English: We have ten coconut trees. When speaking about human beings we have different forms in Tulu. patt jana – Ten persons. English: One comes, one goes. English: He is a gentleman. English: They don’t speak with each other. English: They both went to the temple. Ordinal numbers tell the order of how things are set, they show the position or the rank of something. We have to add suffix ‘ane’ to make ordinal numbers. Al onjane klAs’D kalpuval – She is studying in first standard. For ‘first’, we have also these words in Tulu: ‘suru’ and ‘kaDIr’. ‘suru’ is most commonly used in daily conversation. nUdu sarti – Hundred times. To make adverbial numerals, we need to add ‘sarti’ to the number. Tulu: kuDora (kuDa + ora) paNpana? English: Will you tell me once more? English: I will read it twice. English: I will wait till 2 o’clock. Tulu: yAn raDD gaNTae kApuvae English: I will wait for 2 hours. English: He will come at 1 o’clock. English: He will come in an hour. English: He will come within an hour. English: I always wake up at 7 0’clock in the morning. English: I go to school at 8 o’clock. All right! With this we come to the end of lesson 6. See you next week! 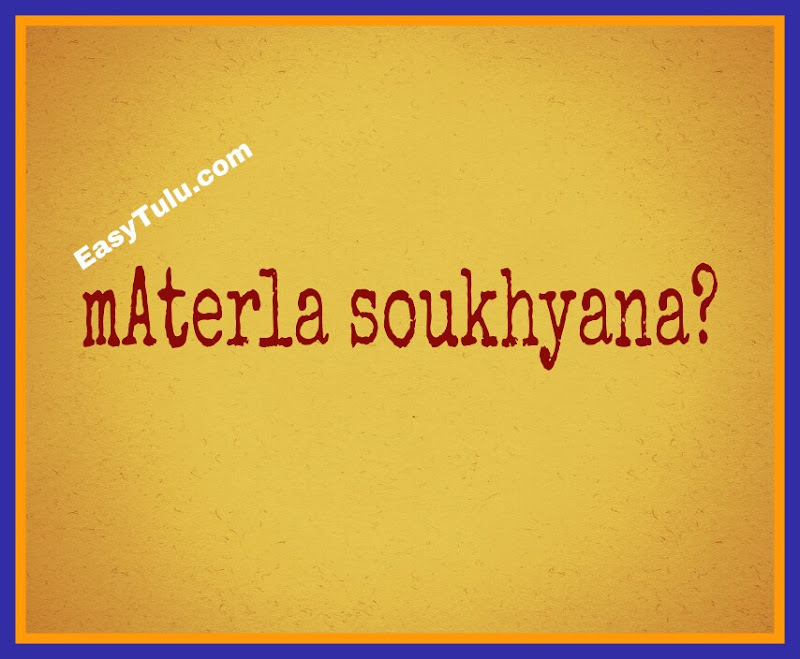 If anyone asked you how are you in Tulu, you can reply them ‘ushAr ullae’ or just ‘soukhya’. Both mean the same ‘I am fine’. Also, instead of ‘encha ullar?’ you can ask ‘soukhyana?’ or ‘ushAr ullara?’. You know Tulu has different subjective pronouns to speak with elders or strangers with respect. Ir - you, Ar (remote) – He/She, mEr (proximate) – He/She. But there is no separate verb conjugation for these pronouns. Verbs are conjugated like if it was plural. But in interrogative form of sentences when you speaking to elders/strangers with respect, you can optionally add ‘e’ or ‘ne’ instead of ‘a’ or ‘na’ at the end. It’s not compulsory; you can also say ‘Ir gobbuvara?’, but adding ‘e’ sound at the end makes it more polite and many prefer it while speaking to elders. Aye gobbujena? – Doesn’t he play? soukhyana? – Are you fine? Now look at the following sentence. He is a nice man, right? He is a nice man, isn’t he? 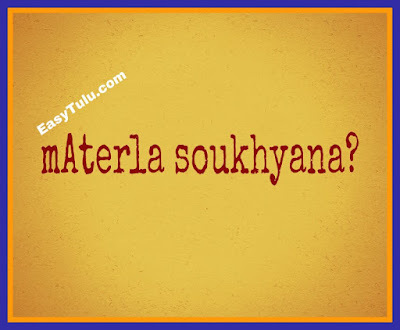 This kind of questions can be asked in Tulu using ‘ata’. Aye eDDae naramAni, ata? - He is a nice man, right? Aye ellae barpe, ata? – He will come tomorrow, right? Whether he will come or not? This kind for questions can be asked in Tulu using ‘ijja’. ijja? – isn’t it?/or not? Aye barpena? – Will he come? Aye barpena, ijja? - Whether he will come or not? yAn tulu pAtervae – I speak Tulu. I tulu kalpuvana? Will you learn Tulu? Ir tulu kalpuvare? 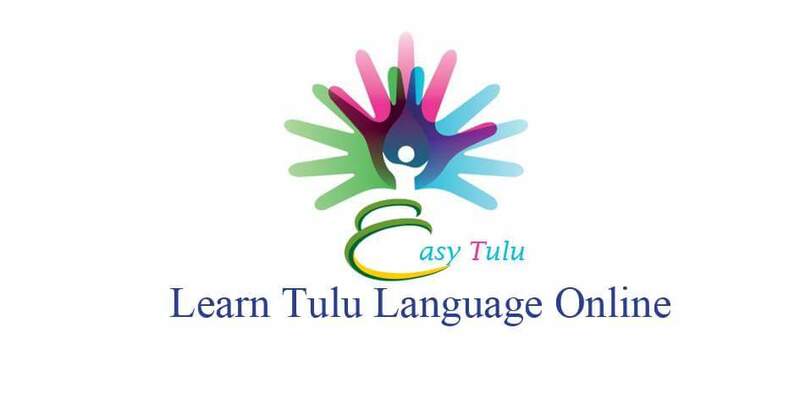 Will you learn Tulu? nikk tulu barpuNDa? Do you know Tulu? ireg tulu barpuNDe? Do you know Tulu? nikk tulu gottuja? Don’t you know Tulu? ireg tulu gottuje? Don’t you know Tulu? nikk tulu gottuNData? 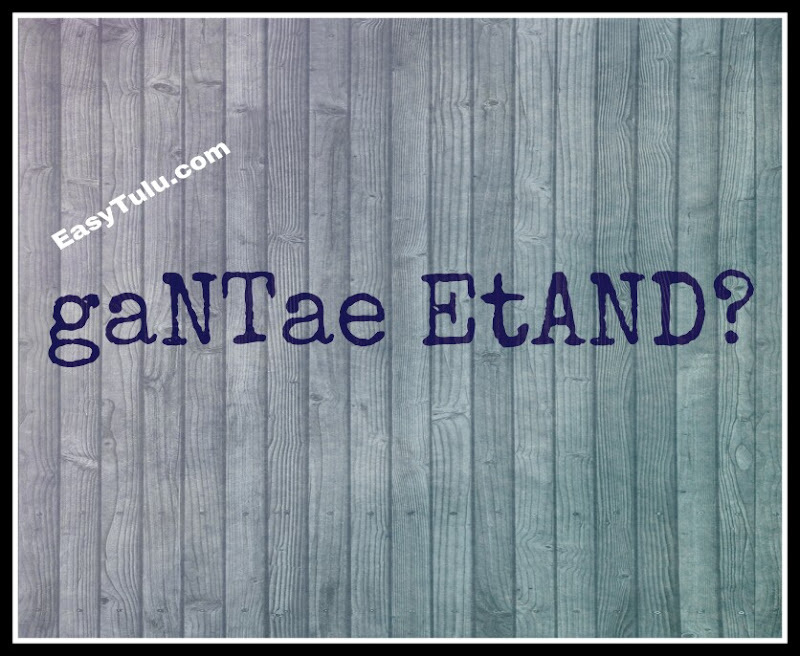 (gottuNDu + ata) – You know Tulu, right? ireg tulu gottuNDate? - You know Tulu, right? nikk tulu barpujata? (barpuji + ata) – You don’t know Tulu, right? ireg tulu barpujate? – You don’t know Tulu, right? nikk tulu gottuNDa, ijja? - Whether you know Tulu or not? ireg tulu barpunDe, ijje? - Whether you know Tulu or not? yAn ellae kuDlag pOpae, Irla ennoTTugu barpare? – I will go to Mangalore tomorrow, will you too come along with me? Avu, yAnla barpae – OK, I will come too. yAn Doctor Apae – I will become a Doctor. yAn Doctor Apujae – I will not become a Doctor. Also, this verb is used to express feelings. English: I don’t feel pain. English: He has head ache. English: He waters the plants every morning. English: He works at night and sleeps during the day. Tulu: ninna jOkulu sAleg pOpera? English: Do your children go to school? Kannada: ninna makkaLu shAlege hOgtAra? Tulu: irena jOkulu sAleg pOpere? Kannada: nimma makkaLu shAlege hOgtAra? English: Do I sleep early? English: I will tell her. English: These children will write. ‘I’ and ‘A’ are demonstrative adjectives. If we learn numbers from one to twenty correctly we will have no problems with the rest of the numbers. So, please try to learn the first twenty numbers and you’ll have no more problems! Click here to know verbs meaning. All right! If you have any questions, feel free to comment. See you next week! Today we are going to learn negative and interrogative form of sentences in Simple Present tense. Before we start, let me tell you how to conjugate auxiliary verb ‘ippu/uppu’ (Infinitive: ippuni/uppuni – To be). There are two forms of this verb exist in the Simple Present tense: ‘uppu/ippu’ and ‘ul’. 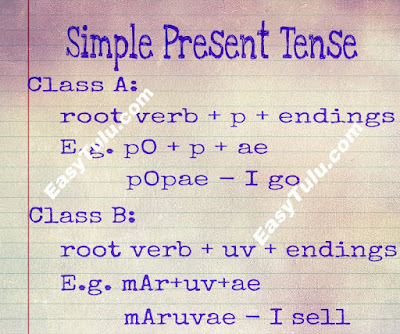 This form is used in simple present tense and future tense. English: I am always here. English: He will be there tomorrow. This form mainly used to tell about existence. English: I am here, Where are you? English: There is a monkey on the tree. English: They have 2 dogs at there house. So ‘uNDu’ means ‘it is’ and its opposite is ‘ijji’ which means ‘it is not’ or just ‘no’. This form mainly used to tell about non-existence. English: I don’t have money. English: I am out of town. English: It is not possible. 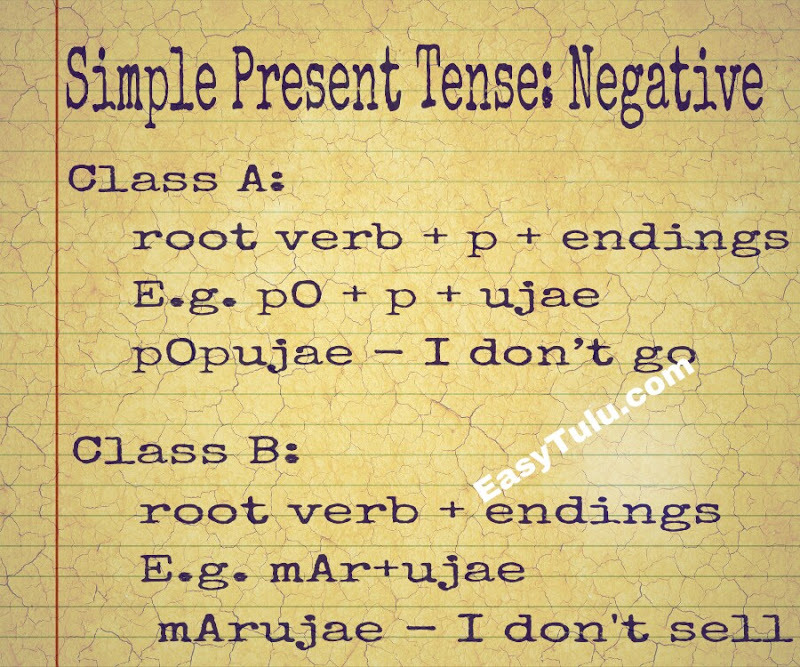 Now let us look at the personal endings for negative form of sentences in Simple Present tense. Note: You may see some people use ‘uji’ ending for first person singular, ‘yAn pOpuji’ instead of ‘yAn pOpujae’ though grammatically it is wrong. For Class A verbs the rules are same as explained in the previous lesson to conjugate the verbs in Simple Present tense, but all you need to change the personal endings to make it negative. For Class B verbs, we don’t have to add ‘uv’ sound since personal ending starts from ‘u’ sound. We have to add personal endings directly to root verb. mAr + ujae = mArujae – I don’t sell. English: I don’t go to school. English: He doesn’t sleep at night. English: She doesn’t speak with anyone. English: They don’t drink tea. English: Why don’t you come? English: We will never meet again. To make the interrogative form of sentences, we need to add ‘a’ or ‘na’ at the end. If a word or sentence ends in vowel ‘a’, ‘e’, 'ae' or ‘o’, then add ‘na’. If a word or sentence ends in a consonant (half-u), ‘i’ or ‘u’, then add ‘a’. But what is important here is the way we pronounce the sentence to make it a question. I barpana? – Do you come? Aye barpena? – Does he come? Al barpala? – Does she come? au barpuNDa? – Does it come? nama barpana? Do we come? nikulu barpara? – Do you come? akulu barpera? – Do they come? aikulu barpana? – Do they come? English: Do you go to school? English: Yes, I go to school. English: No, I don’t go to school. Instead of saying the entire sentence, we can simply say the verb to answer such questions. English: Will he come tomorrow? English: Yes, he will come. English: No, he will not come. English: Will you come tomorrow? English: Will they not come? English: Will you drink tea? English: Will you have lunch? English: Will you not eat anything? English: Don’t you come home? Tulu: illaD mAta ushAr ullera? English: Is everyone fine at home? English: Do you have money? 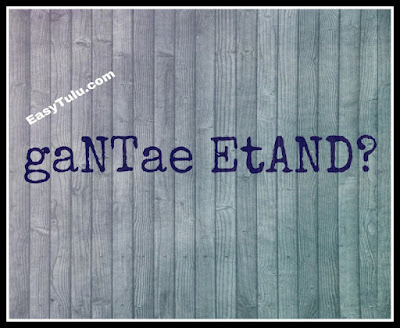 Tulu: nama patt gaNTeg ettuvana? English: Will we reach at 10 O’clock? Kannada: nAvu hattu gaNTege taluptEva? Tulu: Al kANDae bEga lakkuvala? English: Will she get up early in the morning? Kannada: avaLu beLagge bEga ELtALa? ‘and’ means Yes or correct. ‘ijji’ means No or ‘it is not’ or ‘does not exist’. We have another word in Tulu ‘att’ which means No. I kiraNa? – Are you Kiran? att, yAn kArtik. – No, I am Karthik. I pOpana? – Will you go? undu satyana? – Is this true? I Oduvana? – Will you read? Click here to know more verbs. 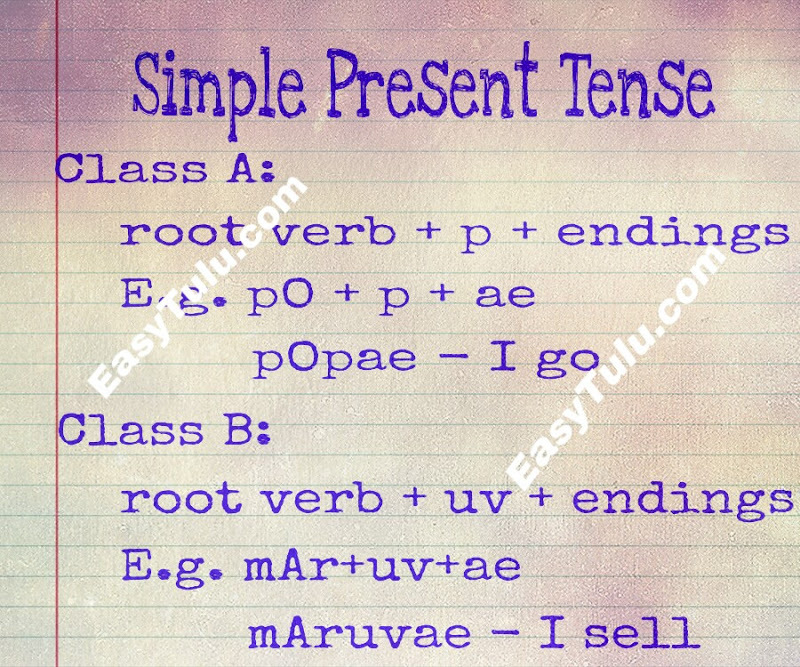 Today we are going to learn simple present tense. Simple present tense used to remark habits, general realities, repeated actions or unchanging situations. In Tulu it’s also used for future tense. Aye pOpe – He goes. Aye mAruve – He sells. Aye kaDapuve – He crosses. Can you see the difference? Yes, first two verbs are conjugated by adding extra ‘p’ sound and other two verbs are conjugated by adding ‘uv’ sound. So what is the difference between these verbs? If you studied ‘chandas’ in Sanskrit or in any other Indian languages, it is simple! If a root verb takes 2 or less than 2 ‘matras’ (meters) to pronounce, then the sound ‘p’ is added and if a root verb takes more than 2 ‘matras’ to pronounce, then it is conjugated by adding ‘uv’ sound. Please note that in Tulu, words which end with consonant sound has final ‘half-u’ sound as I explained in How to Pronounce. So, while calculating ‘matras’, make sure to consider ‘half-u’ as equal to a vowel. 1. Root verb has only one syllable. 2. Root verb should not have more than 2 syllables. If root verb has 2 syllables, then any of the syllables should not have a long vowel or more than one consonant. Otherwise, it is conjugated by adding ‘uv’ sound. Syllable is a unit of pronunciation having one vowel sound, with or without surrounding consonants. The number of times that you hear the sound of a vowel is the number of syllables in a word. Eg: ‘rAjA’ has 2 syllables rA and jA. Now take the verb ‘pO’. It has only one syllable. So it can be conjugated as pO + p + personal ending. The verb ‘bare’ has two syllables ‘ba’ and ‘re’ and each has one short vowel and single consonant. So it can be conjugated as bare + p + personal ending. The verb ‘mAr’ has two syllables (including final ‘half-u’ sound i.e mA and rŭ) and the first syllable has a long vowel. So it is conjugated as mAr + uv + personal ending. The verb ‘kaDapu’ has three syllables ‘ka’, ‘Da’ and ‘pu’. So it is conjugated as kaDapu + uv + personal ending. Let us take one more verb ‘malpu’. It has two syllables ‘mal’ and ‘pu’. First syllable has two consonant sounds. So it is conjugated as malpu + uv + personal ending. Got it? You do not have to worry about it. I will make two groups for your reference; Class A and Class B. Whenever I come across new verbs, I will keep updating it in Vocabulary page. Let us make some short sentences in simple present tense. To begin with, we need to know the structure of a sentence. In Tulu, we have subjects at the beginning and verbs at the end of the sentences. All other items such as objects come between these two. Sometimes objects may come at the beginning and subjects in the middle. ‘uN’ verb only used to indicate eating rice. From ‘uN’ we have the word ‘oNas’ which means lunch or dinner. In South India, normally everyone eat rice for lunch and dinner. ‘tiN’ verb used for other eatables. From ‘tiN’ we have the word ‘teNas’ which means eatable. 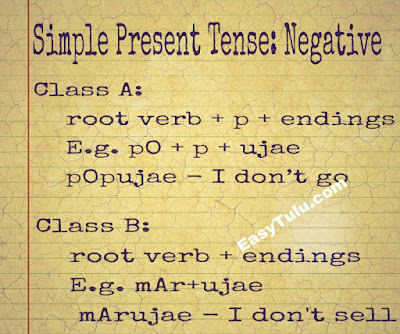 In Tulu, Simple Present Tense also used for future tense to talk about prior plans, strong intentions, fixed arrangements and to make promises or threats. Please try to make sentences using other verbs listed above. If you need help, feel free to comment. See you next week!